Continuous monitoring to ensure services dependent on the firewall are available. View the health and performance of firewalls in a single pane of glass. Automate firewall monitoring to improve operational efficiency. If your firewalls fail, you run the risk of not delivering the network services that are critical to your business. 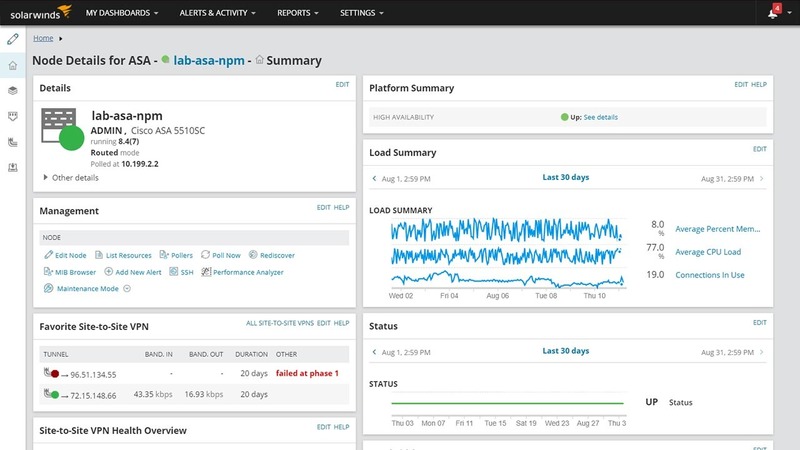 SolarWinds Network Insight for Cisco ASA, a feature of Network Performance Monitor’s Cisco network management software and Network Configuration Manager, automates the monitoring and management of your ASA infrastructure in a management solution. Get visibility into the health and performance of your entire Cisco ASA environment including objects, contexts, and ACLs in a single pane of glass. Easily view the status of VPN tunnels to help ensure connectivity between sites. Monitor firewall high availability, health, and readiness. Automatically discover ACLs, which zones they are assigned to, and what interfaces are assigned to those zones. Easily search for and filter within ACLs, show hit counts for individual rules, and automatically detect shadow and redundant rules. Improve operational efficiency and reduce manual firewall troubleshooting with SolarWinds Cisco ASA monitoring tools. Compare changes in ACL configs and identify their impact on network performance. Optimize ACLs through the elimination of shadow rules and redundancy. Automatically discover all security contexts, and easily backup and restore configuration files for each context. Monitor Your Firewalls Like an Expert. See how Network Insight for Cisco ASA can help. Dependency of critical network services on firewalls requires continuous monitoring to ensure availability. Without complete visibility into all firewalls, risk of downtime increases. Manual troubleshooting of firewall ACL configurations is time consuming, error-prone, and slows staff productivity. What is Network Insight for Cisco ASA? Software that monitors the health and performance of Cisco ASA infrastructure as part of SolarWinds Network Performance Monitor.